Enjoy Boiron Flu-Like SymptomsOscillococcinum(1ets) . 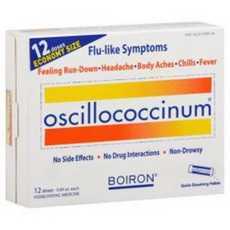 Oscillococcinum (Pronounced: O-Sill-O-Cox-See-Num) From Boiron Is A Homeopathic Medicine That Provides Relief Of Flu Symptoms Such As Fever, Chills, Body Aches, And Pains. * Indications For Oscillococcinum: To Reduce The Duration And Severity Of Flu Symptoms* Boiron's Mission Statement: "To Stimulate The Evolution Of Healthcare By Promoting Scientific Homeopathy As A More Compassionate, More Ecological And More Comprehensive Approach To Medicine And To Allow Every Physician To Know Homeopathy And Integrate It Into Their Daily Practice. * Boiron Was Founded In 1932 In Lyon, France, By Twin Brothers And Pharmacists Jean And Henri Boiron. It Is Now The World Leader In Homeopathy.Lyon, France, By Twin Brothers And Pharmacists Jean And Henri Boiron. It Is Now The World Leader In Homeopathy. (Note: Description is informational only. Please refer to ingredients label on product prior to use and address any health questions to your Health Professional prior to use.